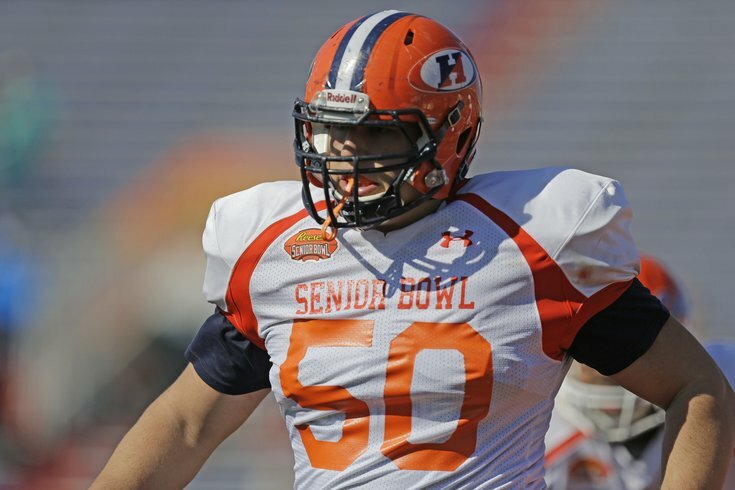 Hobart OG Ali Marpet could be on the Eagles' radar after a strong showing at the Senior Bowl. - In my Day 2 notes, I noted that Nate Orchard was a legit option for the Eagles at 20. I would like to immediately flip flop. Orchard has been a terror all week rushing the passer both from a two point stance and with his hand in the dirt. However, today was the first day we got to get a good look at him in coverage. In a word… Ew. Orchard is more likely to end up as a 4-3 DE. - Another linebacker who has been toasted throughout the week has been Cincinnati ILB Jeff Luc, who is under 6'0 and weighed in at 263 pounds. Luc can be effective in the run game, but will have to come off the field on passing downs. - Minnesota RB David Cobb has had a good week catching the football, and he looked the best out of all the North Team RBs in pass protection. However, during one red zone drill, tiny little Texas CB Quandre Diggs of Texas (5’9, 196) stoned him at the goal line. That was somewhat alarming. Diggs also intercepted Bryce Petty. - Nebraska RB Ameer Abdullah has had a great week showing burst and making people miss in open space. However, his inability to pass protect was exposed today. It’s easy to run right through him. - Hobart OG Ali Marpet has really impressed this week. He played guard and tackle in college, but will likely be an interior lineman only in the pros. In 1-on-1 drills he violently threw Stanford DE Henry Anderson to the ground. Coming from a small school, Marpet has not been intimidated against big school players in the slightest. The Eagles have a history of drafting big school players since Chip Kelly became the head coach, but Marpet seems like a logical player of interest if the Eagles can look past that. - One great battle to watch in trenches at times this week has been Washington NT Danny Shelton vs Duke OG Laken Tomlinson. Tomlinson did a great job anchoring against Shelton, who may be the highest pick among all players competing at the Senior Bowl. - This year, no one player has been overwhelmingly dominant like some guys in previous years. For example, last Senior Bowl Aaron Donald was basically unblockable. It would be hard to even pick someone out who has had a performance even remotely close to Donald’s a year ago. - Chip Kelly spend the entirety of the North Team practice talking to Chiefs GM John Dorsey.